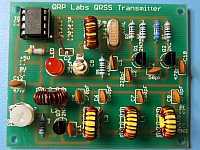 This QRSS Transmitter Kit was produced in 30, 40, 80 and 160m versions from May 2010 onwards. The kit is no longer available and the following information is provided for information purposes only. 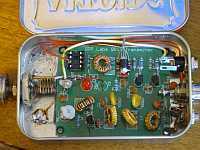 18-Nov-2015 Here's a very nice page by Dave AA7EE on using this QRSS kit on the "HiFer" unlicensed band, 13.56MHz. The kit contains a keyer chip programmed with the buyer's callsign, all components, and a 2.5 x 2-inch PCB. CLICK HERE to see the Kit Instructions (these are the updated version instructions. For the original instructions of the first 100 kits sold at Dayton 2010, scroll down this page). CLICK HERE to see the Kit Instructions translated into French by Yannick XV4TUJ. CLICK HERE to see the Kit Instructions translated into Italian by Giorgio IK3NLK. Here are some images of exactly what you get in the kit, including the circuit diagram and some photos of the 'scope output and frequency counter displays from my own kit build. A selection of comments and photos from kit builders. 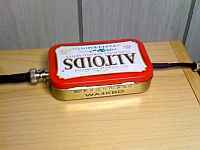 Aldo produced a simple modification to change the mode from FSK/CW to plain on/off QRSS. Click here for the original instructions which accompanied the first 100 kits, the ones sold at Dayton 2010. That kit needs some notes to augment the instructions (click). Some builders have reported that the keyer chip does not correctly enter the QRSS mode they selected. There is also sometimes confusion about the 12wpm callsign ID. The proper operation is for the keyer to issue your callsign once in 12wpm CW when you power up, then drop back to the QRSS mode you have selected. If you do NOT get the QRSS mode that you expected from your pin 5, 6, 7 settings, then there could be a problem with the specific AVR keyer chip or the environment it's operating in (e.g. RF around etc), that causes the chip to falsely recognise the input pins as high when you have not connected them. 2) Connect a 10K (or so) pull-DOWN resistor from each of pins 5, 6 and 7 to ground, to ensure again that none of the pins are left floating. Dave G6WZA writes: "Hi, thanks for the kit. I have built it up,it works very well! The only thing was that I had to change C9 from 25pf to2-6pf to get the Osc. to go to 3500.850". A number of other builders have sent similar comments, also relating to 40m. It seems that to pull the 40m and 80m crystals up slightly to 800-900Hz above the band edge (the usual 40 and 80m operating spot for QRSS), the capacitance needs to be quite low and have had to use a smaller variable trimmer capacitor to achieve it. Others have suggested that the inductor in series with the crystal is not needed to achieve the correct frequency, on any band (not just on 80m). Clearly, some experimenting is perhaps in order if the crystal can't be tuned onto the desired frequency with the trimmer capacitor C9. Kevin ZL1UJG writes: "It may be beneficial to have a fixed capacitor instead of the inductor for the 80m band. Some have tried smaller values of trimmer, but something like a fixed capacitor of 8.2 pF may help. (values either side of this may be needed). The crystals probably expect to see something like 30 pF to be at 3.500000 MHz, and correspondingly smaller to go up in frequency. There is probably a lesser effect on 40m, but on 30m, it probably is close to resonance with a 30 pF, but not tried as I have the coil in." "A fellow QRSSer in Hamilton, had some startup issues, after having to pull the crystal significantly. I suggested that he add a 10nF or a 100nF bypass capacitor across the collector resistor in the oscillator. This appeared to work well. I think the negative feedback due to the unbypassed collector resistor, may be marginal in some instances." Claudio modified his QRSS kit to include CW and Hellshreiber, CLICK HERE for more information.